The Presidio is one of the jewels of San Francisco. It is hard to believe that it was once an army base; it is easy to believe that it was one of the most sought-after postings in the army. Several of my military friends were stationed there, and they describe a wonderful life. 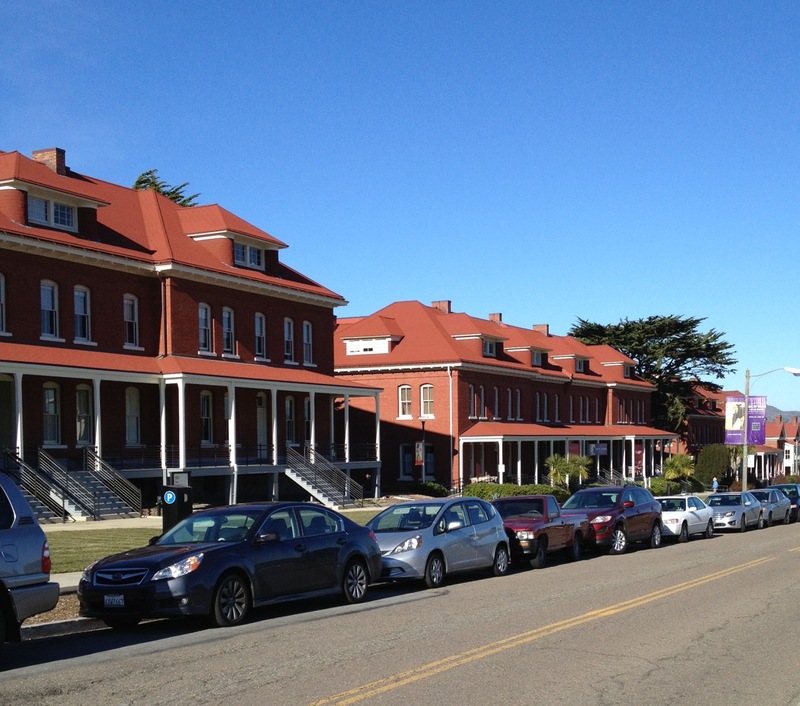 Now the Presidio has been taken over by the National Park Service. The apartments for enlisted men and NCOs have been substantially upgraded and are now available for rent. Many of the officers’ homes have been converted into boutique offices or upscale housing. The base hospital has been turned into very stylish apartments. I have been told that the base commander’s home now rents for more than $30,000 per month. From the outside it is a grand house, and the views of San Francisco Bay are amongst the best in the city. There are tennis courts, a beautiful golf course, and miles of walking and biking trails woven amid great stands of eucalyptus and pines as well as huge beds of native plants.. All of this is left over from army days. Not hard at all to see why the Presidio was such a choice assignment. Some of the administration buildings have been converted to tourist attractions. These include an interesting Walt Disney museum, George Lucas Productions, a bowling alley, and a conference center. The Crissy Field airstrip has been turned into a waterfront mall of dark green lawn, perfect for flying kites or for outdoor events. The scenery is spectacular. The Golden Gate Bridge is right there; the Marin Headlands are a beautiful view; and the imposing cliffs of Land’s End rise from the other direction. I forgot to mention Baker Beach, popular with the whole city. With all of this activity and the wonderful attractions, there are not many places to eat. Fortunately, there is the Presidio Social Club near the Lombard Street Gate. During the Second World War, a barracks building was converted into clubhouse for enlisted men and women. Over the years, it had become a bit shabby and then with the imagination of the Park Service the place was refurbished and opened as a charming restaurant and bar. The walls are covered with images of people from past days having a good time. The rooms are furnished with old-timey lights and spare-but-trendy chairs and tables. There is a nice but limited selection of wines, and it is a good place to get that old San Francisco classic, the Negroni. The food is well-prepared and includes some creative takes on comfort food – deviled eggs, meatloaf, grilled cheese, and chicken salad – as well as some more substantial offerings. More famous San Francisco restaurants like Greens are not too far away, but the Social Club is definitely a great place for a break during your visit to the Presidio. We are back in San Francisco awaiting the birth of our new grandchild. It will be Sarah’s second child, and she is more than ready for her pregnancy to be over. While we wait, we are trying to give her a hand as well as helping our son and his family in Silicon Valley. This seems like an opportune time to visit Rich Table. Sarah is not going in, and Evan is working full throttle. The three-year-old will soon learn he is not the center of the universe. Last night we had a wonderful feast with delicious offerings from the menu. Rich Table is well known for its inventive, modern cocktails, but we settled on traditional standbys – an Old Fashioned and a Manhattan. Both were very well made, and they were even better with a few sardine chips (potato chips with sardines woven into slits and served with horseradish creme fraiche) and radishes with toasted fresh yeast. The radishes seem appropriate as the Rich Table menu is festooned with a red radish drawn by Evan’s father. For starters. 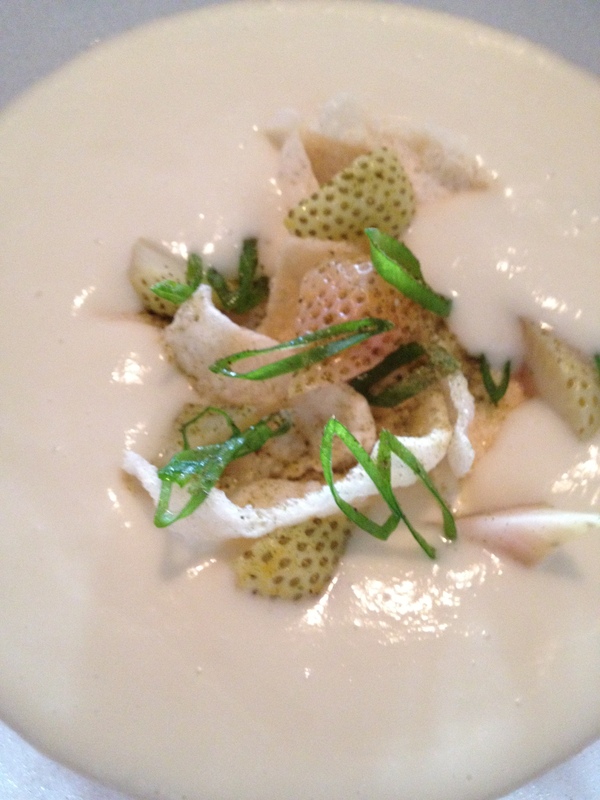 we both chose the chilled spring onion soup sever over bay shrimp and green strawberries that had been lightly pickled. Who could believe that a green strawberry could taste so good. 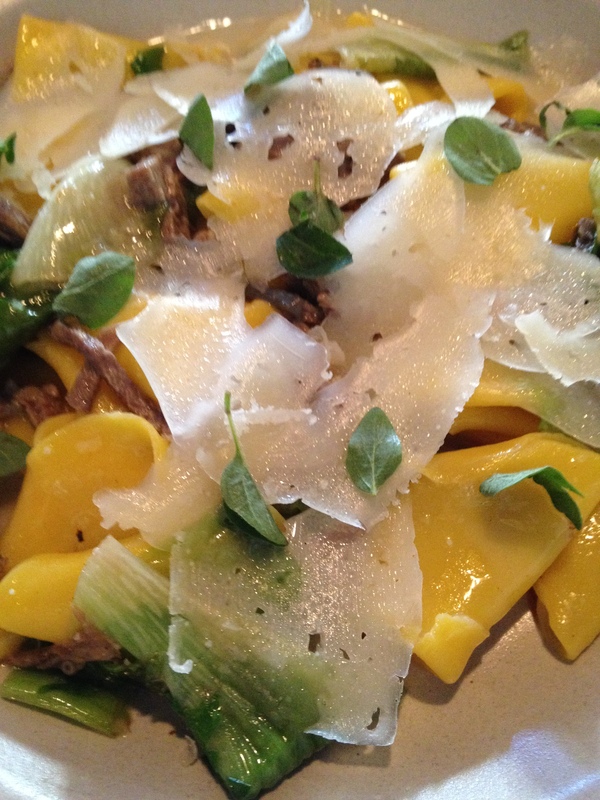 For my pasta course I chose cappellacci (full name: cappellacci dei briganti – literally, brigands’ hats – shaped like little caps) with beef tongue, escarole, and sun dried tomatoes. Rich with butter, the dish was delicious and everything worked together so well. The tongue was tender and flavorful. Susan chose black onion chitarra, a sort of pasta made with a form of tight, parallel wires nicknamed a chitarra or “guitar”. 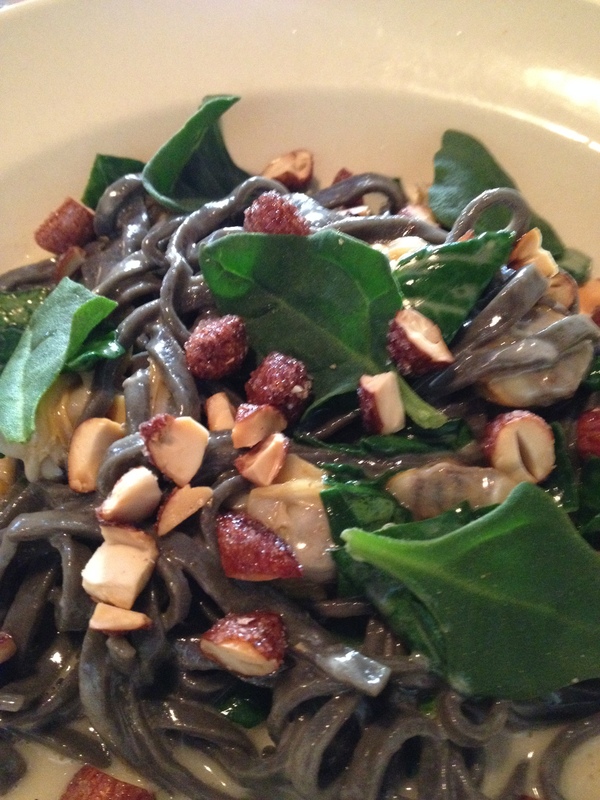 The pasta was dark with the black onion and served with manila clams, almond, and spinach. Another delicious dish. For my main course, I ordered glazed pork cotechino (a traditional Italian sausage) served with asparagus diamonds, sour orange, and a sunchoke coulis. Susan had the swordfish with artichoke and seaweed barigoule, and fava greens. We could not pass up dessert; we didn’t really try. My choice was panna cotta with a burnt sugar sauce. Susan chose white chocolate cheesecake with fennel and pomegranate seeds. We both got California creamsicles as an amuse bouche, and Susan finished off with Rich Coffee containing house made Irish Cream! My son recently gave me an amazing new camera. It’s called a Lytro light field camera, and it operates on an entirely different principle than regular cameras. Peter is a techie who lives and works in Silicon Valley, so he is always up to date with the latest gadgets. This camera captures light in such a way that you can focus on any part of your image, and change the focus with the touch of a finger. You can also take close-up images from only a few centimeters away from the subject, so he thought that I would find it useful in making images of food. In spite of the instruction manual, using the camera is not intuitive – at least not for someone of my age. With practice, though, I think I have caught the hang of it. Also, you need a computer with a fairly recent operating system to take advantage of the focusing feature. Unfortunately, when you publish the images you have to convert them to jpegs so that the focusing is lost. Thus, you won’t be able to get a full appreciation of how unique the camera is, and how much fun it is to use. Except for the images of the Lytro camera, which I made with my iPhone, the images in this post are made with the Lytro. Let me know what you think of them. I know. I know. You are not supposed to mix fish and cheese. But I was looking for something to photograph with my new camera and decided to use what I was cooking, macaroni and cheese, as the test . But how can a person put plain old mac and cheese on a food blog? So I added a few twists to make me feel better. One of those twists is the use of Old Bay seasoning which adds just a little bit of pep to shellfish. Be careful, though, or you can over-do it. You can also omit the seasoning if you like. Here it is, then, shrimp, artichoke, and mushroom mac and cheese shot with a Lytro light field camera. In a medium saucepan, melt 3 tablespoons of butter over medium heat. add the flour and stir in the flour cooking for a few minutes to remove the raw flour taste. Add the milk and bring to a boil, stirring constantly to remove any lumps and to avoid scorching until thickened. Turn the heat to low and stir in the Cheddar, mozzarella, and Swiss cheeses. Adjust the seasoning with salt and pepper. Add optional Old Bay seasoning. When the cheese is melted and the sauce is smooth, remove from the heat and set aside. In a large pot, bring the salted water to a boil. Add the macaroni and cook at the boil, stirring occasionally, until the macaroni is al dente. Drain. In the large pot, combine the cheese sauce and cooked macaroni. Prepare the baking dish by heavily greasing the inside with butter. Then coat the butter layer with panko crumbs. Pour in the macaroni mixture. Combine the toasted panko and grated Parmesan cheese. Sprinkle the mixture over the top of the macaroni mixture. Bake for 45 minutes in the middle of an oven pre-heated to 350°F. If the top becomes too brown, cover with aluminum foil and continue baking. One of my activities during the recent hiatus from my blog was a child-sitting assignment in Yosemite National Park. (A rough chore, I admit.) Our daughter and son-in-law had accepted an invitation to participate in the Ahwahnee Hotel’s annual Chefs’ Holiday. They did a cooking demonstration of two of their most popular dishes and then cooked a sit-down dinner for around 150 enthusiastic diners. Of course, everyone knows about the magic of Yosemite National Park. The scenery is so gorgeous that you cannot avoid a gasp when you first see it. The crashing cascades, still water, towering monoliths, and beautiful meadows are spectacular. Ansel Adams’s black and white images are classics that less talented photographers like me try to imitate. The Ahwahnee Hotel is less well-known although it has been there since the 1920s. The story goes that an aristocrat from England came around the turn of the twentieth century to take in the beauty of the Valley, and there was no lodging up to her standards or expectation. Thus, plans were developed to build a hotel that would suit the most discriminating visitor. The hotel was built in a secluded meadow with a singular view of Half Dome; it was built of redwood-stained concrete so as to avoid the fires that had destroyed so many of the classic national park lodges of the time. There were lots of amenities, too, with a large staff, beautiful dining room, and comfortable guest rooms. Over the years, the hotel has been well maintained and remains the place where park visitors go when they want to feel a little pampered. Our first night arrival was late, so we ordered drinks and bar food in the handsome Ahwahnee Bar. The food was good, but inexplicably the chili (in the western United States) was served Cincinnati-style with lots of cloves, cinnamon, and allspice. OK, but not my favorite. During the tourist season, Yosemite is well known to be a crowded place, but in the winter there are many fewer visitors. This makes it wonderful to see and photograph the various sights, and it also affords the hotel the opportunity to sponsor some special events. The oldest is the Bracebridge Dinner which is held during the Christmas season and features an English banquet along with costumed players and singers. The Vintners’ Holiday highlights some of the most famous California vineyards and wines. The Chefs’ Holiday attracts well-known chefs and food experts from all over the country for cooking classes and unique dinners in the beautiful dining room. Sarah and Evan demonstrated two of the most popular dishes at their San Francisco restaurant, Rich Table: porcini-dusted donuts with a fluffy raclette sauce and sardine chips accompanied by horseradish sauce. Then with the help of the kitchen staff rom the hotel, they prepared a several-course dinner and wine-pairing for 150 people. While Sarah and Evan were working, Grandma and Grandpa were obliged to take care of the three-year-old. That meant walks to landmarks, playing in the fresh snow, and observing a herd of beautiful – and tame – deer. It was a most enjoyable task in a beautiful place with few tourists. There is a new international grocery store in town. It is filled with some of the most interesting and amazing ingredients – octopus tentacles, duck feet, Asian fresh fruit, etc., etc. During a recent visit, I noticed sitting in the cooler were little packages of 10 quail eggs each. The eggs were so beautifully speckled and tiny that I couldn’t resist buying them even though I didn’t have any idea what to do with them. There are recipes on the internet for fried quail eggs and Scotch quail eggs, but both of those suggestions seemed like a waste of a unique ingredient. My thought was to wait until our daughter the chef came to visit and have her give me a cooking lesson. So I did. She suggested deviled eggs as being easy to do, very tasty, and insurance that the eggs would be well cooked and safe to eat. (She’s in the middle of her pregnancy.) That sounded like a plan, and I am glad that I followed her suggestion. In the end we cooked them up for the rest of the family so we didn’t worry about presentation. There was no time for that before the eggs disappeared. They were cute and delicious, and Sarah’s recipe is worth modifying for conventional deviled chicken eggs. Remove the eggs from the hot water and immediately plunge into ice water. Cool until still slightly warm. Peeling them will be easier while they are a little warm. Crack the shells all over with the back of a teaspoon, and peel under a stream of running water. Using a cheese wire, cut the eggs in half lengthwise. You can use a knife, but it must be razor-sharp or you will be disappointed with your effort. Remove the yolks and place them in a small bowl with the mustard, sour cream, salt, and pepper. Using a dinner fork, mash the ingredients together until they form a smooth paste. Adjust the seasoning. If you wish, you can press the mixture through a tea strainer to make it even smoother. Load the mixture in a pastry bag fitted with a small point. Pipe the mixture into the empty egg white cases. Decorate with a small frond of fresh dill.